These days when it comes to affordable M.2 SATA drives, there’s more to look at than just the Samsung 850 EVO. Plextor’s SATA 6Gbps M7V SSD is considerably cheaper—and it actually bested its rival in one of our performance tests. But a lower price tag often comes with compromise, and the M7V unfortunately follows suit. In other performance tests, it showed inconsistencies. The only difference between the MG7 on retail shelves and the one we tested is that ours used a Samsung DRAM cache instead of the Nanya shown here. The M7V is currently available in three capacities: 128GB for $50, 256GB for $71, and 512GB for $136. That’s 39 cents, 28 cents, and 27 cents per gigabyte respectively. Pretty darn competitive. 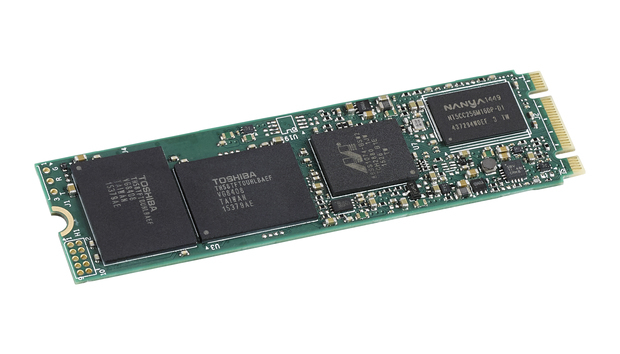 The drive comes in the 22x80mm form factor that’s most common with M.2 drives of any ilk: That would be SATA in this case, but most PCIe/AHCI and PCIe/NVMe as well. The M7V is also unusually thin, thanks largely to the high-density of its TLC NAND. Only one chip is required to provide 512GB of storage, leaving the opposite side of the PCB (printed circuit board) empty. You’ll have no problem fitting two of these babies in a stacked M.2 slots, and there will be better air flow around them to ward off premature failure. We were initially suspicious that the M7V actually was an 850 EVO, as the 1GB DRAM chip (used for buffering) on our test drive was labeled Samsung. However, peeling back the Plextor sticker next to it revealed a Marvell 88SS1074B1 controller and Toshiba 15nm NAND. Samsung’s drives use the company’s own controller and NAND. Lite-On owns the Plextor name so call this drive an international (Korea, Japan, Taiwan, and...) effort. Plextor’s PR person informed me that the Nanya DRAM you see in the pictures now ships in place of the Samsung chip. This is the only side of the M7V with chips, which leaves more room when stacked in double M.2 slots. The M7V is warrantied for three years and/or 80TBW (terabytes written) for every 128GB of capacity. That’s about par for the industry, whose representatives are constantly reminding me that these are very conservative estimates. The areas where the M7V compared well to the 850 EVO were small file writes, as well as all types of reading. Both drives are based on TLC (triple-level cell/3-bit) NAND and drop to around 300MBps writing when the fast NAND cache (TLC treated as faster 2-bit MLC)) is exceeded. Plextor wouldn’t tell me exactly how much NAND was treated as cache, but the point at which write speeds dropped off was at about the 10GB mark, or just around 2 percent of total capacity. The more common allocation is 2.5 percent of total capacity. AS SSD rated the drive as reading sequentially at 494MBps and writing at 336MBps with 10GB worth of data. That’s slightly slower than the Samsung 850 EVO’s 508MBps reading, but faster than the EVO’s 319MBps writing. 4K/64-thread writes were a similar story. On the other hand, the M7V was significantly slower with the single-thread 4K writes at 59MBps, compared to the 850 EVO clocking 97MBps. Single-thread 4K reads were also slower at 23MBps, compared to 36MBps. AS SSD 4K 64 thread and 10GB sequential test results.There’s little difference between the M7V and 850 EVO. Single 4K write speeds as indicated by AS SSD. We included the 1GB test to show an unusual drop-off between the 1GB and 10GB test sets. 20GB read and write tests. Aside from the large file write, where the M7V ran out of cache sooner, performance is comparable. Where the differences between the EVO 850 and the M7V became more apparent were in our 20GB read and write tests. The M7V’s write rate fell off significantly at the 10GB mark when it ran out of cache, but there was also a large momentary drop-off earlier. Subsequent to the drop-off, speeds varied considerably where the EVO 850’s performance remains relatively flat. Copying our 20GB single large file to the M7V resulted in an extremely inconsistent operation with all sorts of dips and peaks. Cache ran out after about 10GB. This shows writing a 20GB file to a 256GB Samsung 850 EVO. There’s one drop after the cache is emptied, but performance is consistent after that. The climbing and dipping is most likely interaction between the main body of NAND and the cache. It could be a choice to wring every ounce of performance out of the drive, or poor regulation. Only time and driver or firmware updates will tell. The MG7 gets the job done, it just does it oddly. Plextor also bundles its PlexTurbo software which dedicates part of your system memory to caching data for the drive. It allows minor tweaking, but it’s primitive compared to Samsung’s similar RAPID software. I never recommend caching software for mission-critical applications, as loss of power can lead to losing any data that’s stranded in the cache. It can also get in the way of certain drive-intensive applications. However, for everyday use, it can be sweet. But Samsung’s RAPID mode is transparent, PlexTurbo is not, and PlexTurbo also produced even more of those dips and climbs, not to mention very inconsistent results in AS SSD. I removed it. Hopefully it will have improved by the time you read this. Other than the large-data drop-off, which in most user’s day-to-day usage is rare, both the MG7 and the EVO 850 provide the full-on SSD experience. The MG7’s dips and climbs are unsightly, but produce roughly the same overall, everyday performance. Given the right price, the 5125GB Plextor M7V could be an attractive alternative to the Samsung 850 EVO. I’d stay away from the 128GB and 256GB models which have proportionately less cache and subject you to the large file-write drop-off sooner. As a matter of fact, if writing large amounts of data is a common scenario for you, the Samsung EVO 850 is worth the small premium. Better yet, opt for an MLC SSD that offers consistently fast performance across the board.